by Victoria Zelvin. Back in September of 2011, the White House unveiled plans for what was called Digital Promise, which sought to put the development of learning software, including educational games, into practice. Partnered with them, much to the surprise of some, was Valve Software, the video game developer of the very popular Half-Life and Portal titles. At a press event, USAToday even quoted Valve co-founder Gabe Newell as joking, “We were like, ‘Aren’t we enemies? Aren’t we entertainment, and isn’t that in opposition to education? '” However, since 2011, Portal (and now Portal 2) has made itself a staple of video game based learning in many classrooms. Portal is, at it’s core, a physics platformer. Players, called “Test Subjects” are locked in a room, with the exit on the opposite side of some obstacles, at the behest of a fictional company called Aperture Laboratories. These obstacles range from immense drops, pools of water, sentry guns, lasers, and more. The Test Subjects will have to use a tool called the Portal Gun, which shoots blue and orange portals at the walls that they Test Subjects can then use to navigate the room. The rooms rapidly advance in difficulty, often requiring pulling together many moving pieces in order to solve the room. If the Test Subjects complete all the rooms, then they shall be rewarded with cake. Applauded both for it’s innovative gameplay and it’s sarcastic, deadpan (often maudlin) humor, Portal was a runaway hit. 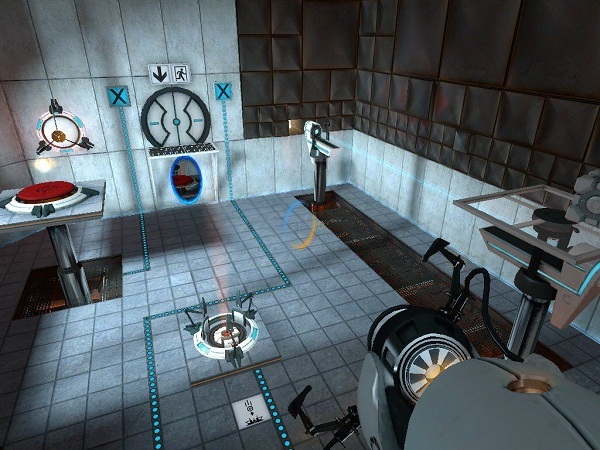 Portal 2, a longer release with more levels, also introduced a multi-player aspect where players must work cooperatively to solve rooms. Getting Started. The official website, Teach with Portals, offers many resources for educators to help get them started. As developer Valve says: “Using interactive tools like the Puzzle Maker to draw students in makes physics, math, logic, spatial reasoning, probability, and problem-solving interesting, cool and fun, which gets us one step closer to our goal ‘“ engaged, thoughtful kids!” The website also offers sample lesson plans and ideas, in categories ranging from physics, math, game design, and language arts. Educators can download the program through “Steam for Schools,” an educational version of the immensely popular PC game platform, which strips out everything that does not serve an educational purpose. Steam for Schools includes access to Portal 2 and the Portal 2 Puzzle Maker. This service will be entirely free for educators to use, even out of beta. By making Portal and Portal 2 available to schools, Valve hopes to encourage STEM learning. On the outset, Portal offers a way for students to challenge themselves creatively and share maps with their friends, but it also fosters spatial reasoning, problem solving, physics, and many other benefits. Students are already playing popular games like Portal in their down-time, and more and more there are attempts to combine education and entertainment. Students Creating Video Games. One such initiative is challenging students to create video games of their own. Claiming inspiration from President Obama’s Educate to Innovate Campaign, the National STEM Video Game Challenge hopes to motivate interest in STEM learning by tapping into students’ natural passions for playing and making video games. Other games already include level designer features, with the intent of promoting sharing and creativity in online communities. There are plenty of ways for students to foster learning through video games, and video game developers like Valve have known this for a long time. Below is a video of seventh grade students at the Evergreen School visiting developer Valve in 2011 to partake in fun learning tools, like the Puzzle Maker. “And once they got in that level, I don’t think I could teach them anything more, they were so excited about being able to play it and it being something that they created that, that was pretty much the end of it,” laughs Phil Co, detailing the enthusiasm students brought with them to Valve that day. This entry was posted in educational innovations, future of education, STEM. Bookmark the permalink.